Description The Lamb of God, standing on top of checkered pavement, and supporting a flag with a gold cross was a popular symbol for Jesus Christ that originated from the Gospel of John: “Behold the Lamb of God which taketh away the sins of the world (1:29).” The outer ring of the plate is decorated with gold acanthus leaves, between each of which is an orange triangle topped with a bud and small flower. The front of the plate is decorated with gold metallic luster, a style adopted from imported Spanish pottery. The back of the plate is ornamented with two groups of concentric circles painted in ruby luster. Giorgio Andreoli’s workshop—located in the Umbrian town of Gubbio—became famous for its specialization in metallic luster during the sixteenth century. For more information on Giorgio Andreoli see 48.1331. To view other works by the artist and his workshop, click on his name in the “creator” field. 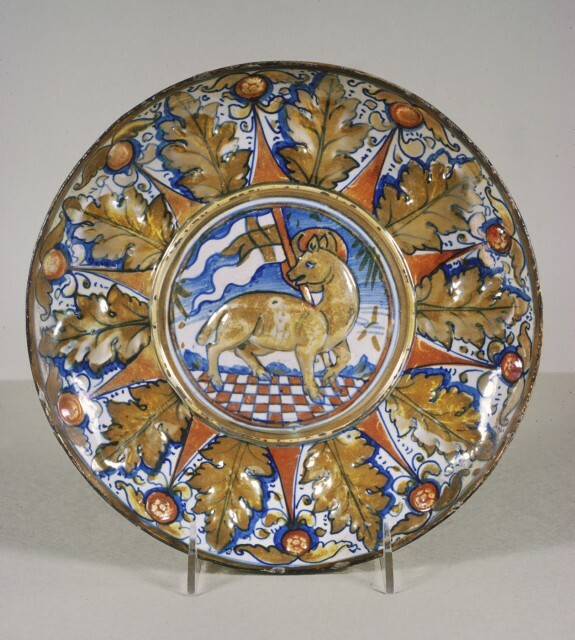 To see other maiolica wares featuring the Lamb of God, see 48.1353; for “maiolica” in general, see 48.1336. Provenance Gaillard [date and mode of acquisition unknown] [no. 455]; Seligmann and Rey [date and mode of acquisition unknown]; Henry Walters, Baltimore [date and mode of acquisition unknown]; Walters Art Museum, 1931, by bequest.